Can seasonal migration be an alternative households’ livelihoods strategy in the semi-arid zones? 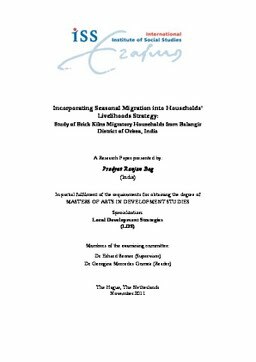 This study explores the impact of seasonal migration at the household and community level. The study was undertaken in the semi-arid zone of Southwest Orissa (a state of India). Seasonal migration to the brick kilns of Andhra Pradesh (a state of India) is the type of migration this research dealing. Consistent with the livelihoods approach to migration theory, this study found that seasonal migration has overcome insufficiency caused by seasonality, and improved migrants’ access to resources. Remittances in the form of advance payment meet the credit needs and improve the credit worthiness of migrant households. Improved wellbeing at the household level creates labour demand in the source and reduces the gap between patron and client relationship. The study highlights that socio-political institutions influence the benefit of seasonal migration. While ineffective government policy minimizes the benefits of seasonal migration, the benefits of seasonal migration bring positive changes in the social institutions. In order to maximise the benefits of seasonal migration, an enabling environment need to be created through appropriate migration policy.